Lama Zopa Rinpoche sitting outside Thubten Shedrup Ling Monastery, Bendigo, Australia, October 2014.
International Merit Box Project Now Accepting Grant Applications for 2015! New FPMT Study Group in Cyprus! 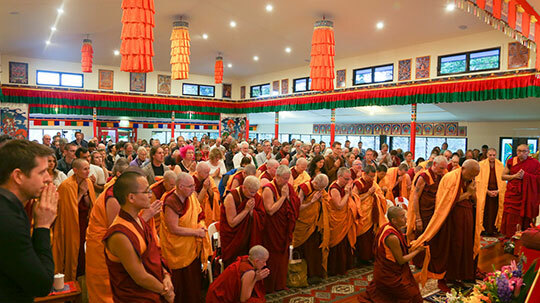 Sangha and lay students watch as Lama Zopa Rinpoche makes prostrations before teaching, Chenrezig Institute, Eudlo, Australia, September 2014. “… If you’re able to practice Dharma in the West, it’s a great talent; you are a great hero, wow. Someone who is able to be a monk, able to be a nun, even a lay person practicing pure Dharma – wow, wow, wow – it’s unbelievable, unbelievable, as generally speaking, it’s not easy in the West. Those who are doing practice are heroes. That is the main thing to think about Sangha – they are heroes. 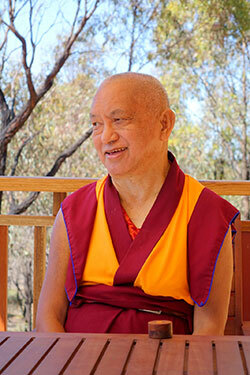 During the recent retreat in Australia, Lama Zopa Rinpoche agreed to allow those who listen to a recording of Rinpoche giving the oral transmission of the Sutra of Golden Light to receive the transmission in full. You may receive this oral transmission by listening to the audio or from watching and listening to it on video. We are pleased to make both the video and audio available for you. Prayers and Practices to be Reborn in Sukhavati includes The Swift Path to Sukhavati by Panchen Losang Chökyi Gyältsen as well as The Benefits of the Pure Land Sukhavati, a commentary by Lama Tsongkhapa. Practices of Arya Sitatapatra (White Umbrella Deity) is a collection of two practices, The Supreme Accomplishment of Sitatapatra and Praises and Repelling Practices of Sitatapatra. Both of the texts above are available as free downloads from the FPMT Foundation Store. Two new Basic Programs have recently made a successful start, one at Centro Cittamani Tara in Padova, Italy; and the other at Ganden Tendar Ling in Moscow, Russia. Each welcomed some 25 students for their first classes while simultaneously offering the teachings online for those who may miss a class. Congratulations! Basic Program students have two excellent opportunities for fulfilling part of their Basic Program retreat requirement. Centre Kalachakra’s retreat center near Paris is offering a one-month lam-rim retreat from December 27 onward, and both English and French speakers are welcome. Also, Institut Vajra Yogini, in the south of France, is offering a month-long lam-rim retreat from January 25 onward. Anyone can contribute to these incredible offerings by donating to the Puja Fund to help cover the costs. If that is not possible, please rejoice and mentally offer all of this activity on your own behalf. Amitabha Buddha statue on Amitabha celebration day, Buddha Amitabha Pure Land, Washington, US, August 2014. Take a moment to read “Amitabha Buddha Celebrated at Buddha Amitabha Pure Land,” a two-part article written by Ven. Holly Ansett about the arrival of a 16-ton (14,790-kilogram) marble statue, a special project of Lama Zopa Rinpoche, to Buddha Amitabha Pure Land in Washington State in June. 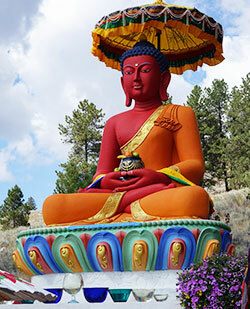 See amazing photos and learn how Rinpoche celebrated the statue’s installation! Mandala regularly publishes news articles, inspiring photographs, and engaging multimedia content as part of our blog. Check back daily or subscribe to have our content delivered directly by email. We happily offer the 2010 edition of the English-language Discovering Buddhism DVDs for $10, reflecting a nearly 80% discount! The 2010 edition is exactly the same as the newer 2014 edition for $55, except for two minor and easily corrected technical glitches (instructions included with DVD). Merit Box grants for 2015 are available for centers, projects, services, study groups and initiatives that further the mission of FPMT. Please contact meritbox@fpmt.org for an application. The deadline for applications is March 31, 2015. Consider encouraging your students and supporters to become Merit Box practitioners and collecting offerings to support future grants. Order your group’s free Merit Box practice kits today! At the recent CPMT meeting, many aspects of the Foundation Service Seminar were highlighted. If your region is lacking a Foundation Service Seminar facilitator, there will be a Foundation Service Seminar facilitator training at Land of Medicine Buddha, Soquel, California, USA, January 28-31, 2015. Ven. Paloma and Gun Cissé sharing their stories of meeting the Dharma, Day 4 CPMT 2014, Australia, September 16, 2014. Go to the CPMT 2014 minutes to enjoy videos of Wisdom Culture talks given during the meeting by Khen Rinpoche Geshe Chonyi, Paula de Wijs-Koolkin, Ven. Gyatso, and Ven. Paloma together with Gun Cissé. Also find a booklet about fundraising offered by Australian Kimball Cuddihy, experienced former center director. A reminder in case you missed Lama Zopa Rinpoche’s advice to offer Lama Chöpa tsog on Losar (Tibetan New Year) to honor the anniversary of Lama Yeshe’s passing away. 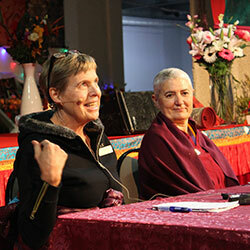 We welcome new FPMT study group, Thab-she Ling, in Cyprus! Today is the closing date for applications to offer service as director at Chenrezig Institute, Australia. Milarepa Center, USA is looking for a spiritual program coordinator and Root Institute, India urgently needs a kitchen coordinator and a general manager/assistant director. Shakyamuni Study Group (probationary center) in Italy, has closed – we rejoice in their efforts to serve sentient beings.